I was unusually proud of Obama today when I saw that he was making a full-throated defense of free expression in the wake of today’s savage attack of the offices of Charlie Hebdo in Paris. It’s good to see Obama standing up for human rights, and more importantly for the core values of our civilization: the values that have lead to unparalleled freedom and prosperity for billions of people globally. It is sad to see these values under threat today, in today’s attack and others, by those who think that being offended is a justification for murder. This isn’t the first time we’ve seen this particular brand of Islamist violence around the world in the last couple of years in response to “offense to Muslims.” A YouTube video allegedly provoked the protesters at Benghazi. Deadly riots ensued in Afghanistan and elsewhere after Terry Jones declared his intention to burn Qurans in Florida. Of course, we all remember when Danish embassies around the world were violently attacked, and riots broke out over the Muslim world where almost 200 people were killed, because Danish newspapers published cartoons depicting the prophet Muhammed. It is one thing when this violence occurs abroad–in mob protests encouraged and sanctioned by corrupt regimes to score political points–it is quite another thing when violence hits the source. Therein do we we see the true contrast between the values of those who, despite what the apologists may think, wish to create a theocratic dictatorship, and those who seek to uphold civilized values of freedom of religion, expression and thought for all people. When Salman Rushdie was forced into exile by a fatwa issued on him and the assassination attempts that followed, the apologists on the left and the right condemned his alleged offense of Muslims instead of the hit put on him by a foreign preacher and the people who attempted to carry it out. We have seen Lars Vilks, Theo van Gogh, and others been murdered for offending Muslims, or in the case of Hitoshi Igarashi, murdered for translating a work alleged to have offended Muslims. We have seen attempted assassinations and death threats against Kurt Westergaard, Ettore Capriolo, Ayaan Hirsi Ali, and others. And now, we can add to the list of victims of Islamist violence the 12 cartoonists and journalists who were murdered in cold blood today by home-grown crazies shouting Islamic phrases in unaccented French as they proved, quite sadly, that the sword can be mightier than the pen. What happened in Paris is sickening and inexcusable, and it is good to see a near-universal condemnation of this violence as well as a full-throated defense of free speech. Their crime isn’t explained by cartoons or religion. Plenty of people read Charlie Hebdo’s cartoons and managed to avoid responding with mass murder. Plenty of people follow all sorts of religions and somehow get through the day without racking up a body count. The answers to what happened today won’t be found in Charlie Hebdo’s pages. They can only be found in the murderers’ sick minds. It’s as if these people thought, “we should murder a bunch of journalists in cold blood,” and only then decided to research some religions, luckily finding one that offered the precise pretext they needed to accomplish their goals, and went about creating an elaborate backstory whereby their murders would now be justified because the victims had insulted their new ideology. Except people do do it. They do it when they are instructed to by their religion. And it isn’t even a difficult leap to make: they said they did it to avenge their prophet. Why is that such a difficult pill to swallow? Over the next couple of days, we expect to hear a predictable response from Klein and others like him: most Muslims are peaceful, Islam is not a religion of violence, this is all about politics, not religion, etc. And for the most part, these points are a distraction. Because of course most Muslims are peaceful. Of course most people–of any religion–only want to live their lives peacefully and prosperously. But it’s a straw man. The question is “do we have a problem with the way Islam is understood and practiced by an unacceptably large number of people?” The answer is clearly yes. Are there crazy Christians and Jews and Hindus? Absolutely. But that, too, is a distraction. Islam is unique in the world today as a religion with a large number of followers who believe in values contrary to modern conceptions of human rights. Over 90% of Muslims in Iraq, Morocco, Tunisia, Indonesia, Afghanistan and Malaysia believe that a wife is always obliged to obey her husband, according to Pew. The same poll found that over 70% of Muslims in Egypt, Jordan, Afghanistan and Pakistan support the death penalty for apostasy. Although most Muslims in the US are far more tolerant, 8% of American Muslims believe that suicide bombings are “sometimes” or “often” justified to defend Islam. That’s a scarily high percentage. It only takes one person to do something deadly. This may sound like fear mongering, but it isn’t–I could put all the usual disclaimers in here: most Muslims are peaceful, I have Muslim friends, etc, etc. The fact is, that this has little to nothing to do with Muslims as people. It has to do with whether the civilized world–and that includes most Muslims–are doing enough to combat backwards thinking and medieval values. Are we truly doing what needs to be done to stand up for tolerance that allows people to practice their religion freely, but not intolerance that allows them to impose their religious beliefs on others through violence and intimidation? The US probably has the best constitutional framework for this, in that, as a strictly secular political sphere with religious practice guaranteed freedom by the first amendment, we are able to strike a balance between the political and the personal. We should not follow the prescriptions of lunatics who think that banning Muslims from entering the country or outlawing religion is the solution. We should, however, be OK with enforcing our secularism to the benefit of Muslims, worldwide, who share the same values. These are the people who are most in danger–those who are actually tolerant and free-thinking, who are living under regimes or in societies that put them at risk for their beliefs. We need to stand up for the victims of Islamofascism, who are usually Muslims themselves, and protect them–let them emigrate, defend their rights abroad, call out their oppressors and support their revolutions. The apologists will not get us there. The xenophobes won’t get us there. We need a third way. Then, these values must be disseminated somehow, maybe through a combination of political and cultural ambassadorship. At this point, though, I have to admit that I don’t know what’s actionable here. What can we actually do? Other than be on the right side of the debate, and standing up for values of modern civilization, how can we actually turn back the tide of an ideology that, if anything, is getting stronger and its followers more numerous? We can’t go to war against every nation whose values we don’t share. We can’t round up all Muslims because of a few bad apples. We are at risk of being impotent while we get bombed and shot at by an enemy that is far more motivated and bloodthirsty than we are. So I don’t have the answers–I just think it’s important that we realize this is a problem, and that true liberals get on the right side of history to help come up with a solution. You may have read the article in the New Republic last month about how 300,000 ancient books and manuscripts in the libraries of Timbuktu were evacuated in secret to protect them from Ansar Dine, an Al Qaeda cell. The manuscripts not only survived the burning of the Timbuktu library, but were smuggled in footlockers all the way to Bamako, the capital of Mali, where they are currently being hidden away by volunteers until they can be returned. The problem is, Bamako is in the south and the climate is much wetter and thus more destructive to the manuscripts. As I write this, thousands of unique, priceless artifacts chronicling history, philosophy, science, literature, law and religion from the peak of medieval Islamic and North African civilization are slowly being eaten away by mildew. I have teamed up with T160K, Timbuktu Libraries in Exile, to help drive attention and funding toward the preservation of these manuscripts, and by proxy, the preservation of civilization itself. There is nothing more offensive than religious zealots imposing their backwards ideologies on free thinking people. At T160K, we seek to keep these manuscripts safe from the elements while they wait out the Islamist threat in Mali. 300,000 unique books and manuscripts have been there 800 years. They should be around 800 years from now. There are several things you can do to help, but right now we need to fund the Indiegogo campaign. The most disturbing story to come out of the news of late has not been the Michael Pfelger videos (although, unlike Wright, he has managed to issue a somewhat sincere apology). 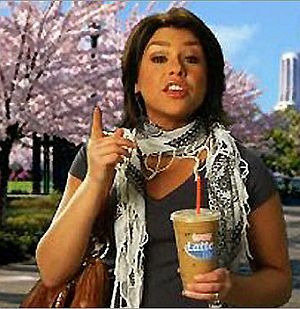 Lost in the Politico’s election analysis and the media’s echo chamber has been a little-noticed story about Dunkin’ Donuts, who just pulled an ad from the air which included Rachel Ray wearing a keffiyeh, a traditional Arabic scarf. What misperception? The wearing of a traditional dress, cultural dress, is somehow a support of Islamic extremism? Conservative bloggers have pointed out, correctly, that the scarf was worn by Yasser Arafat, leader of the Palestinian liberation movement until his death in 2004, and is routinely worn by Islamic extremists and Palestinian nationalists. True. But the scarf is also worn by millions of Arabs, and non-Arabs, around the world, and an overwhelming majority of them would rather not perform extreme and violent acts of terror, thank you very much. Most people who wear the keffiyeh are not extremists, and are certainly not terrorists (and I’m sure Rachel Ray would agree). What’s next? The pulling of Middle East products off store shelves? The sacking of Arab journalists? This is symbolic of a much larger undercurrent of American Islamophobia that has swept the United States (and much of Europe) since before September 11. Indicators of this movement have been rampant: Brigitte Bardot’s incendiary anti-Muslim comments that recently got her fined, riots in the streets of Paris, the Danish cartoon fiasco and of course, conservative commentators’ incessant ranting about the “Muslim problem.” Bill O’Reilly, Ann Coulter and Rush Limbaugh are especially to blame. Of course, now that Barack Obama, a black man with the middle name Hussein, is running for president, the ugliest of the hatred of Muslims in America has come out in full force. In all the talk about racism in this Democratic primary season, the mainstream commentary has forgotten about the real issue of race in this election—not whether Obama is “too black” to be President, but whether or not he is a Muslim. Remember Hillary Clinton’s famous “3AM” ad, in which she asked who would best be able to answer a 3AM phone call to the White House in the midst of a catastrophe? Orlando Patterson wrote for the New York Times that the ad played on subtle racism and the classic white fear of “the outsider within”—the criminal black man infiltrating the safe neighborhood: “The danger implicit in the phone ad — as I see it — is that the person answering the phone might be a black man, someone who could not be trusted to protect us from this threat.” However, the more subtle sub-message, the one that did not have to be stated, was the fact that “Something is happening in the world,” and the terrorists behind that “something”—well, you get the picture. The very idea that a Muslim—a guy who shares a name with the late Iraqi dictator—could be the one answering that call in the White House came across clear enough. Clinton’s margin of victory in Ohio, much larger than the pre-election polls, suggest that late-deciding voters broke for her, and whether the subtlety of the “3AM” ad had something to do with this final push will never be known for sure. A Pew poll taken in late March found that one in ten Americans believe that Obama is a Muslim. The number is telling in part because 10% of Democrats—most of whom already were Clinton supporters—believed this fact, and because 8% of Independents—a group who Obama needs to depend on to win the election in November—believes it as well. Furthermore, a whopping 19% of rural voters—that’s one in five—believed this to be true. The fact that the son of a Muslim Kenyan joined a radical black Chicago church, and then stayed in that church for 20 years, does not help diminish the rumor that he is a Muslim. America is familiar with images of radical black Muslims like Malcolm X and Louis Farrakhan, and should now be equally familiar with Jeremiah Wright’s praise of Farrakhan. The tendency to equate Islam with radicalism of course has been swollen since 9/11. But the underlying assumption is that it is Islam that implies radicalism—not blackness. The fear of Islam “penetrating” American society cannot be understated. This is a major problem, and one that shows no sign of letting up. Let the keffiyeh remind us that hatred of Muslims has increased in recent years. How would America respond if, tomorrow, a skullcap-toting news anchor stepped down because “given the possibility of misperception Mr. ____ will no longer be working with us,” because, after all, “we don’t want anyone to think that we work with Jews.” It’s unacceptable. Milton Friedman wrote that in the long run, the free market will work against discrimination. It’s in the best interest of industry economically, he said, for employers to seek the most qualified people regardless of race, religion, gender, etc. However, the free market in this case has spoken in another direction: “Don’t sell this item because people associate it with terrorism, and thus we will lose business if we keep it on the shelves”–this might be good business, but morally it stinks of bigotry. The underlining assumption is fed, not starved, and thus the evil wheel of bigotry continues to turn, turn, turn.